I’m sure this is not the post that you expected after my rant about eating whatever the heck I want. You probably thought I would write about macaroni and cheese (again) or breaded, pan-fried chicken. I will eventually, don’t worry. But right now I have to talk to you about salad. You see, this weekend, I really wanted a salad. And when my body tells me it wants salad, I listen. I figure it’s a sign that I’m low on some essential vitamin or mineral and I need a whole bunch of green things to correct that. And sometimes I just want salad because it tastes good. Salad tastes so good, in fact, that I have a veritable mental catalogue of happy salad memories. It starts, of course, with my mother’s Ceasar salad. In her late twenties, she was working at a restaurant, where the waitresses were responsible for prepping the salads. Two anchovies, a whole clove of garlic, a half teaspoon of dry mustard and a few tablespoons of red wine vinegar, mashed with a fork into a paste. Whisk in an egg yolk and a quarter cup of olive oil. Toss with romaine leaves, top with lemon juice, freshly shaved parmesan, and cracked black pepper. Toss again. It’s perfect really. Mom always used Colman’s dry mustard, the brand that comes in the bright yellow tin that looks like it came straight out of your grandma’s 1950s pantry. And she always measured the dry mustard using the depression on the underside of the handle of her fork. (Because preciseness matters not one bit when it comes to this recipe.) The salad was always served in a giant wood bowl and dad and I would battle it out for the white, crunchy romaine ribs, which are undeniably superior to the leafy green bits. Is it any surprise that my favorite salad consists of egg yolk, cheese, and nutrition-lite lettuce? But then there’s the salad that I ate every single day during the summer I worked on the farm. Everything was hand picked and hand washed that morning by me or Kitt or Leah. I chopped up every vegetable you could possibly eat raw and put it in the salad bowl: kohlrabi, carrots, mustard greens, green beans, peas, scallions, garlic ramps, radishes, and cucumbers. I made a honey mustard vinaigrette and poured it on top and ate the whole thing. Out of the serving bowl. In one sitting. I craved that salad like it was chocolate fudge or mint chocolate chip ice cream. As I drove home from the farm, I started fantasizing about the salad, salivating over the salad, driving faster so that I could get home and eat that salad already. The salad I am about to tell you about is equally swoon-worthy. In fact, just writing about it is making me yearn for it. It was crunchy and salty-spicy-sweet and very, very fresh. Lightly blanched sugar snap peas, julienned watermelon radishes, and ruffly napa cabbage tossed in a miso-tahini dressing with scallions and toasted sesame seeds. Full-disclosure: we ate this salad alongside chicken fried rice, lest you be fooled into thinking this meal was more virtuous than it sounds. But while I loved the rice, this salad was undeniably the star on the plate. It sings (and fills in those nutritional holes at the same time). 1. Bring a large pot of salted water to boil. Prepare a small ice-water bath. 2. Boil the sugar snaps for about 2 minutes, or until just barely cooked but still crisp. Scoop them out with a large slotted spoon and place in ice-water bath. 3. Once they’re cool, drain and pat dry. Trim ends and cut sugar snaps on bias into thin slices. 4. 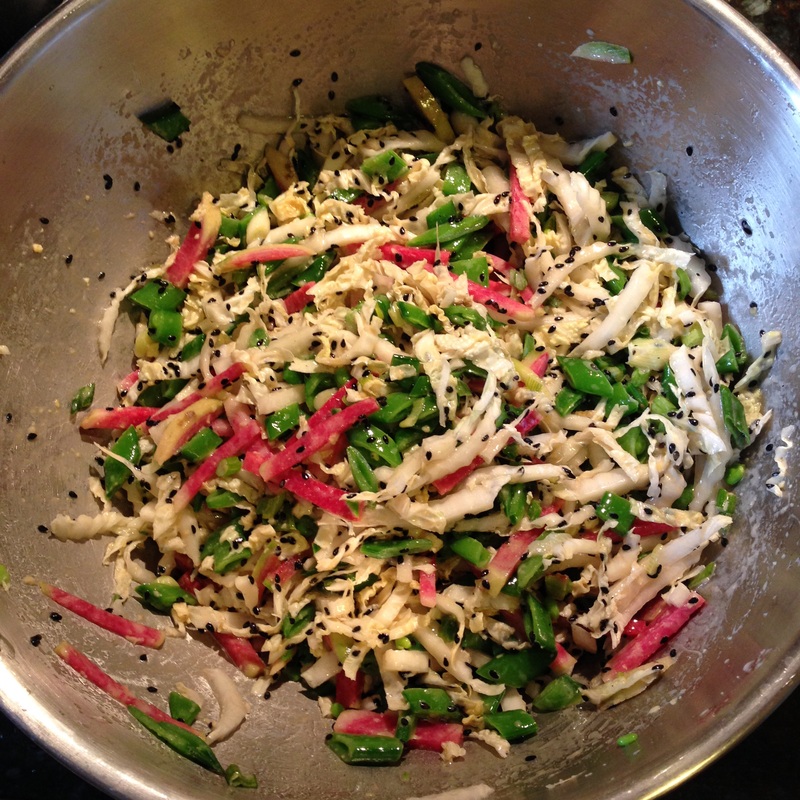 Toss in large bowl with cabbage, radishes, scallions, and 1 tablespoon sesame seeds. 5. Whirl all dressing ingredients, using the smaller amount of miso, in a blender until smooth. 6. Toss salad with half of the dressing and taste. Add more dressing if you desire. Sprinkle with remaining sesame seeds. Tags: asian, salad, vegetables, vegetarian | Permalink. Sammy, you have to visit us in DC, so we can have a Smitten Kitchen party.